Note: This is not the same type of novelty lip plumper that makes the lips swell because youve applied something irritating. This will NOT sting or irritate the lips in any way. Lip Therapy contains a very smooth base of Argan & Emu oils, which nourish lips and provide anti-aging benefits. This will not make you look like youve had injections either  it simply enhances your natural lips, and maximises your natural fullness, reproducing the lips you had in your youth. Its also wonderful for anyone who suffers from extreme dry or chapped lips. REDUCE LIP ANTI AGING APPEARANCE. Defined, full lips are a sign of beauty and youthfulness. 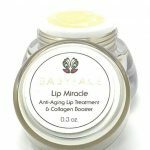 Babyface’s New Lip Therapy is a fantastic daily-use product that can help you keep your lips beautiful, healthy, and restore lost beauty. Containing a special micronized Hyaluronic Acid, which helps to retain moisture in the lips and create a smoother, healthier appearance. The small particles of HA penetrate the thin skin on the lips, and then swell producing a long-term plumping effect on the lips. Treating dryness and protecting our lips though is not as easy as it is for the rest of our skin. Lip skin is different because it is rather thin, so it needs additional attention to keep it from dehydrating, and ageing. Moisture rapidly evaporates from the lips, causing them to dry out very easily. The combined HA and nourishing oils will help prevent dehydration. Lip Therapy also includes a RCS scavenger, which helps to protect delicate lip skin form the harmful effects of pollution.